While watching James Marsh’s multi-Oscar nominated The Theory of Everything (2014), I was struck by how much the film reminded me of another Oscar nominated biopic: Phyllida Lloyd’s The Iron Lady (2011). Like Lloyd’s film, The Theory of Everything is a glossy historical romance anchored by a massively impressive act of mimicry and several strong, if more subtle, surrounding performances. Perhaps the biggest parallel between the two films, however, is the way in which each portrays its subject as less the public figure we all know and more of a “regular Joe” in extraordinary circumstances. In the case of The Iron Lady, this tactic sought to gain audience sympathy for an often divisive public figure. In the case of The Theory of Everything’s portrayal of Stephen Hawking, however, it has the curious effect of taking one of the world’s foremost thinkers and making his world-changing ideas something of an after-thought. 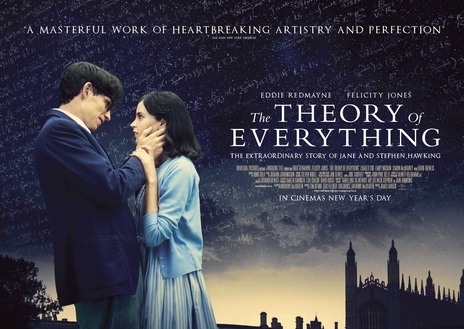 The romance aspect of The Theory of Everything isn’t surprising since the film is based on Jane Hawking’s memoir, “Traveling to Infinity: My Life With Stephen.” As such, we begin with a young Stephen Hawking (Eddie Redmayne) speeding around Cambridge University in the ’60s, as fit, spry, gawky and full of unrepressed energy as any young genius. We see him meet, fall in love with and court young Jane Wilde (Felicity Jones), including actual fireworks to frame the happy couple. We follow Stephen as he works on his doctorate with his mentor, Dennis Sciama (David Thewlis), and are with him when he first gets diagnosed with ALS (Lou Gehrig’s Disease), a two-year death sentence that is currently stretched into its 50th (and counting) year. 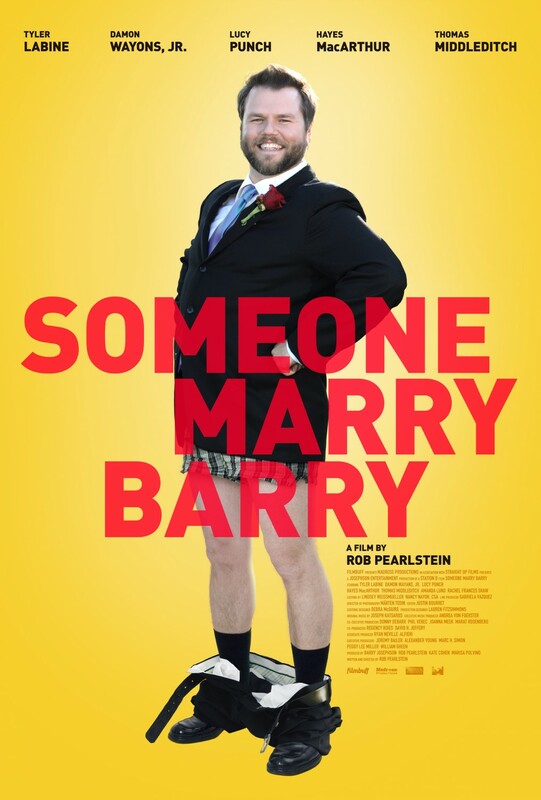 We follow the happy couple as they marry, have kids, go through difficult stretches and end up in the arms of others: Jane with choir director/Stephen’s first live-in nurse Jonathan (Charlie Cox), Stephen with his nurse/vocal coach Elaine (Maxine Peake). Time, we see, marches ever onward, despite the best ministrations of mankind. The cinematography, courtesy of Benoît Delhomme, is consistently attractive, even if the overly “Vaselined” lens effects tend to lend everything a bit of a cheesy air. While the beginning of the film is (rather inexplicably) shot in blue tones, the rest of the movie looks quite warm, lovely and inviting, rather like the bygone Merchant-Ivory weepies. The flash-back structure is effective for telling the story, although I’ll freely admit that the silly “rewind” effect at the finale is a bit of a bridge too far: it’s another affectation that seems calculatedly designed to give the ol’ heartstrings one final tug on the way out the door. Much has been made of Eddie Redmayne’s pitch-perfect portrayal of Stephen Hawking (he would go on to take home the Best Actor trophy at the ceremony) and there’s no doubt that it’s masterful: from his early scenes as a gawky, shy, budding cosmologist to the mid-portion where he begins to lose control of his faculties and the final half where he’s in the full-blown grip of ALS, Redmayne displays a remarkable ability to fully inhabit the character. There’s no point during the film’s two-hour runtime where he’s ever anything less than completely convincing and his rakish charm, in the early going, goes a great way to establish Hawking’s reputation as a bit of a snarky genius. While I still prefer Michael Keaton’s performance in Birdman (2014) as far as all-out acting showcases go, there’s no denying that Redmayne was a worthy recipient of his praise. For my money, though, the real standout in the film is Felicity Jones: her portrayal of Jane is subtle, multi-faceted and possessed of some genuine power. Jones and Redmayne have marvelous chemistry together (their early courtship scenes are just so damn cute) but it’s the scenes that develop Jane’s character that tend to hit the hardest. While the rest of the film is framed, for the most part, as a fairy tale, Jones is brilliant at letting us see the toll that being Stephen’s caretaker has taken on both her life and her academic career (or lack thereof). The scenes between Jones and Charlie Cox have a genuinely sad cast to them that often stands at marked contrast to the rest of the film’s heavy-handed, baroque sentimentality: it’s the difference between a paintbrush and a spray-gun. Ultimately, The Theory of Everything is the latest in a long line of well-made, well-cast and well-realized soap operas, dispensing the expected dramatic beats in all of the expected places. The acting is strong, the film looks quite nice and the less said about the score, the better. That being said, I can’t help but feel as if the film’s rose-colored glasses and tunnel-vision sell its subjects a bit short. In between all of the shining bits, soaring strings and three-hanky moments, there are occasional moments of real, raw power. It’s an important thing to remember: we may want to keep our heads pointed towards the boundless infinity of the cosmos but the real living, the flesh and blood stuff, is still happening right down here, in the dirt.